Penrith Regional Gallery and The Lewers Bequest, Photograph by Adam Hollingworth. Penrith Regional Gallery and The Lewers Bequest. Margo Lewers in the front garden of Emu Plains. Lounge Room at Emu Plains. Elwyn Lynn, Cliffs at Fall, 1961, mixed media on canvas. 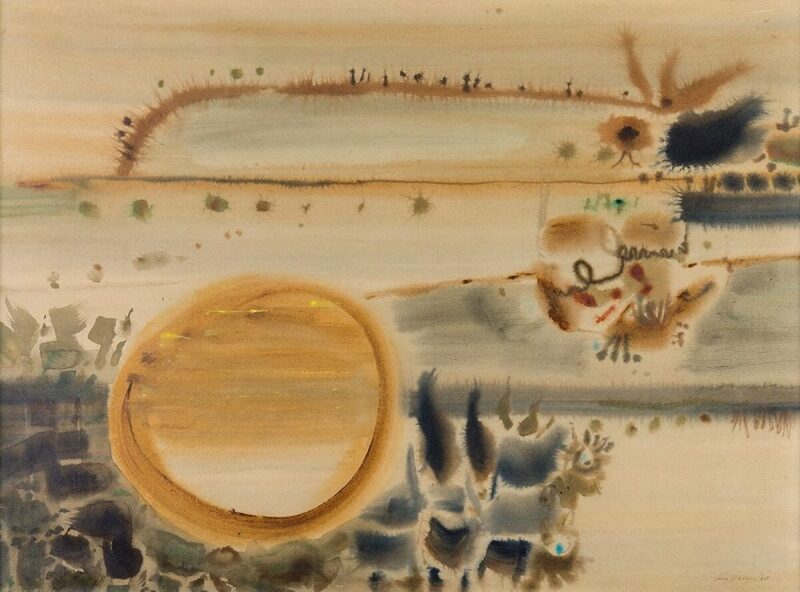 Guy Warren, The Clearing III, 1965. Mason Kimber, Passage Grid, 2017, acrylic and oil stick on canvas. 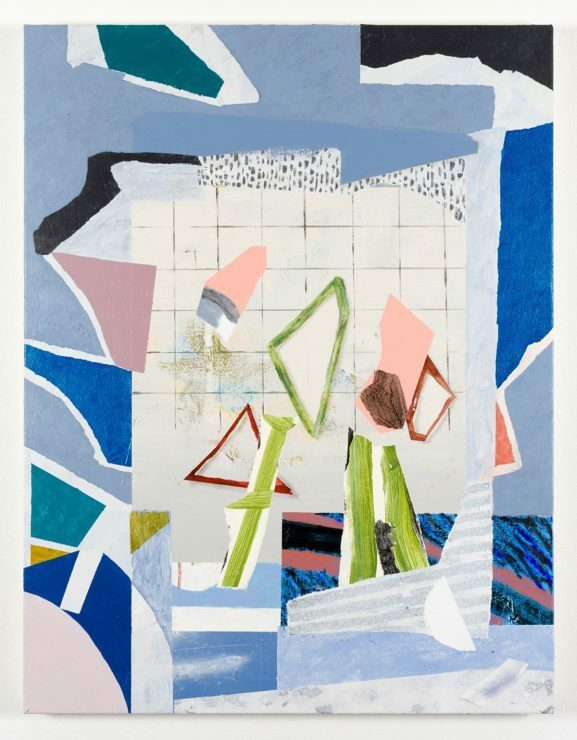 Elena Papanikolakis, Links, 2014, acrylic, photographs, marker, pen and pencil on board. In 1981 the couple’s home became an art gallery, now part of the Penrith Regional Gallery & The Lewers Bequest. In her essay, ‘Modern through and through: the art and lives of Gerald and Margo Lewers,’ Kirsty Grant offers an insight into their creative lives at Emu Plains. Her essay is reproduced with permission. In his evocative recollection of the lives that Gerald and Margo Lewers lived at Emu Plains in Penrith, their friend and renowned Australian author, Patrick White, described an atmosphere in which art, ideas, beauty and community were nurtured and celebrated in equal measure. For him, the Lewers’ home represented a haven in which creativity flourished and intellectual challenge and enquiry was encouraged and where, consequently, some of the diverse strands of endeavour and thought that combined to form a modern and distinctly Australian culture were able to develop. Front view of the Lewers house, 1956. The Lewers’ contribution to Australian cultural life was located firmly within the context of modernism. Both Gerald and Margo were born in the first decade of the 20th century, their formative years taking place against a backdrop of immense social, cultural and technological change, when new ideas and ways of living were transforming the traditions and habits of the past. 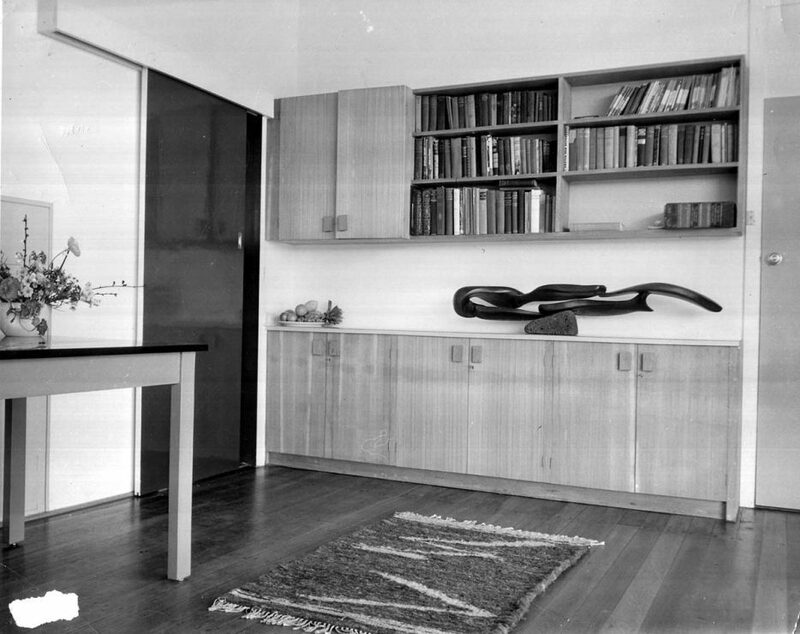 They both shared an artistic vocation and established significant careers – Gerald working in three dimensions as a sculptor in wood, stone and later metals, and Margo, after being one of a handful of pioneering figures who promoted modernism within the field of interior design in Sydney during the 1930s, working across textiles, painting and sculpture. Both artists were recognised with prizes, commissions and the acquisition of their work by major galleries during their lifetimes. They were also responsible for major public commissions during the 1950s and 1960s that introduced the language of modernist abstraction into the suburbs and the cities. Gerald and Margo Lewers also played active roles in Sydney’s broader cultural and creative life through their involvement with influential groups such as the NSW branch of the Contemporary Art Society and the Society of Sculptors and Associates. 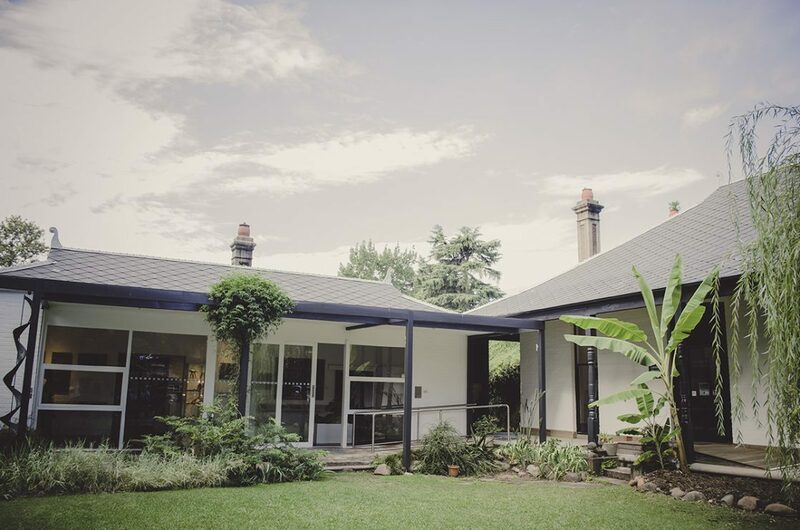 Within the modernist context, perhaps equally as important as their public endeavours was the way in which the Lewers lived, incorporating creative expression into every aspect of their lives so that it ran like an interconnecting thread between the art they exhibited, the design of their home and its interior, the garden they created at Emu Plains and, as Patrick White recalled, even the food they served. It was at night classes with Antonio Dattillo-Rubbo in Sydney in the late 1920s that Gerald and Margo met and where, along with fellow students including Frank Hinder, they were exposed to modern ideas about art as well as receiving foundational academic training. Margo and Gerald on the back verandah. During her visit, Margo Lewers also noted ‘a few hand-printed material lengths … draped here and there [and] … the most delightful mat, carried out in the rarest colours, mechanical balances and movements of their own invention’. (6) The British artists’ unified approach to living, in which their distinctive aesthetic was carried across to the decoration of functional objects and their domestic interior, must have influenced the Lewers who, upon their return to Australia, infused all aspects of their lives with their own distinctive vison and style. The concept of a creative aesthetic applied to both the fine and applied arts, as well as to architecture, was presented to the Lewers again later in the year when they travelled to Europe and in Germany, witnessed the influence of the revolutionary Bauhaus which, although it had closed the previous year in the face of pressure from the Nazi regime, was still strong in all areas of art and design. Margo was impressed by the modern architecture she saw, as well as the design of contemporary pared-back timber furniture, textiles and decorative ceramics(7) and this, combined with other overseas experiences, inspired Margo to adopt the concept of Gesamtkunstwerk – the total creative work in which various different art forms are synthesised – a principle as well as an active practice that would remain a fundamental feature of the Lewers’ life. 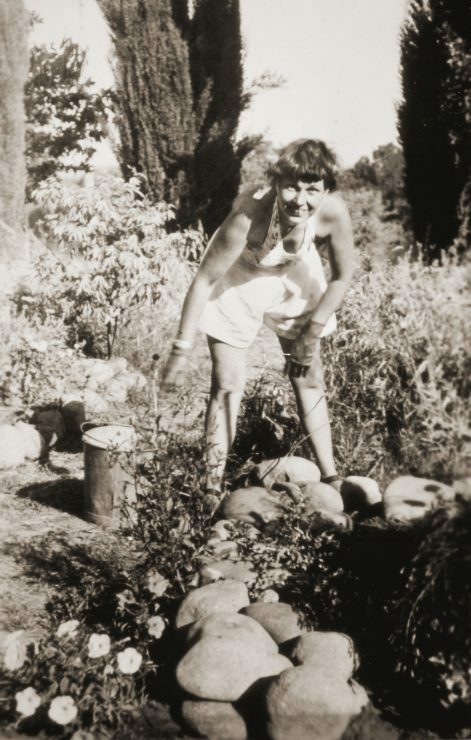 Following her return to Sydney, Margo produced a range of functional modern ceramics and hand-printed textiles, and in 1936, with characteristic drive and determination, she opened Notanda Gallery in the stylish hub of Rowe Street, Sydney. Reflecting the Lewers’ cross-disciplinary approach, Notanda also became a venue for exhibitions of fine art(12) with the first held in 1936 displaying a selection of animal drawings by John Skeaping that they had brought home from England. Material shortages and difficulties importing goods into Australia caused by the outbreak of the World War II prompted Lewers to close Notanda Gallery in 1939; however, her brother, Carl Plate, opened a gallery under the same name two doors up in Rowe Street late the following year. Showing the work of local and international modern artists, Plate’s first exhibition, England Today, included work by Ben Nicholson, Paul Nash and Henry Moore. Like Gino Nibbi’s Leonardo Bookshop in Melbourne, Plate also stocked postcards, prints and publications on modern art, and Notanda Gallery became a popular meeting place, where knowledge was shared and ideas discussed, as well as a vital source of information about contemporary international developments. When Gerald and Margo returned to Sydney, they were in the enviable and rare position of having had firsthand exposure to some of the most advanced developments in modern art and design and having established contacts with influential artists and writers overseas. Gerald had also begun his professional career, exhibiting a group of striking modern sculptures that was very positively received by the London critics. Their role as conduits of information was significant and Margo’s report for the Sydney Morning Herald suggests that she was conscious of the vast distance that separated Australia and its artists from activities in the leading international centres and the value of current information from people ‘on the ground’. Like Dorrit Black and Grace Crowley before them, and artists including Yvonne Audette, John Olsen and Robert Jacks in the generation that followed, the Lewers’ experiences and knowledge, shared informally through their circle of friends and the larger artistic community, as well as reflected in their unique approach to art and life, contributed to the local understanding of modernism and acceptance of new thinking and ways of creating. The eventual evolution of their Emu Plains home into a public gallery that honours their role in the creative life of 20th century Australia and supports the contemporary artistic practice of today through the presentation of exhibitions, education and practical programs continues this process on a large scale. While the Lewers’ experiences overseas saw them poised to develop careers at the forefront of the avant-garde, this took some time to manifest as the realities of daily life and prevailing social mores of 1930s Australia exerted their influence. Gerald returned to full-time work and in 1936, their first child was born, a second daughter following five years later. Inevitably, this slowed them down and it was not until Gerald retired and they moved to Emu Plains in 1950 that both were able to devote more time to making art and their careers realised their fullest potential. Frank Hinder, Margel and Gerry Reading, 1942, pencil and watercolour on paper. Gerald quickly established a reputation as a sculptor of significance with his work being selected for public commission as early as 1940 and two stone sculptures of stylised animal forms being acquired for the collection of the National Art Gallery of New South Wales (now Art Gallery of New South Wales) by 1946. There was, however, an inevitable loss of momentum and the strikingly modern machine-inspired sculptures such as Plough, 1934, that he had made and exhibited in London to considerable critical acclaim did not reappear. He showed two of those sculptures, along with several others made following his return in Exhibition 1, the landmark 1939 exhibition that brought together a disparate group of painters and sculptors including Ralph Balson, Grace Crowley, Eleonore Lange, Frank and Margel Hinder, who were each exploring approaches to abstraction through the figure. Sharing an openness to the modern and a willingness to cast off tradition, it was this group of artists that was instrumental in the establishment of the New South Wales branch of the Contemporary Art Society (CAS). While artistic and political divisions among the members of the Melbourne CAS during its early years resulted in various breakaway groups, with those who remained being largely socially-motivated artists whose figurative art revealed a strong expressionist inflection, the attitude in Sydney was radically different. From the outset, the NSW branch of the CAS was determinedly liberal in its approach, welcoming a diverse membership of all artistic persuasions that included craftspeople, designers, architects, educators and amateurs – a non-hierarchical approach that acknowledged all forms of creativity and that mirrored the Lewers’ own inclusive attitudes. Artistic freedom was the guiding principle and there was ‘a deep distrust of any form of social order or artistic dogma that might restrict individual creativity in any way … Rather than pursuing nationalist themes and overt social criticism, NSW CAS members took a pluralist approach turning their focus outwards and in several directions [from] … developments in constructivism and abstraction … [and] surrealism [to] … the grand tradition of European art’. (17) This welcoming attitude was reflected in annual exhibitions that were open to all members (despite frequent criticism of the unedited nature and variable quality of the entries), as well as in wide-ranging monthly public lectures and a broadsheet that was published from 1947. It has been argued that the NSW CAS was also distinguished from its other Australian counterparts by its active promotion of abstraction as an advanced stream of modernism,(18) and the activities of the organisation and energy of its early members helped pave the way for Sydney to become the most vigorous centre of contemporary abstract painting in the 1950s and beyond. This development also owed much to the fact that the abstract idiom had long been a prominent element of the art of the harbour city with the first wave of ‘Sydney moderns’ including Balson, Crowley and de Maistre, discarding traditional styles of painting in favour of non-representational imagery in the first decades of the 20th century. 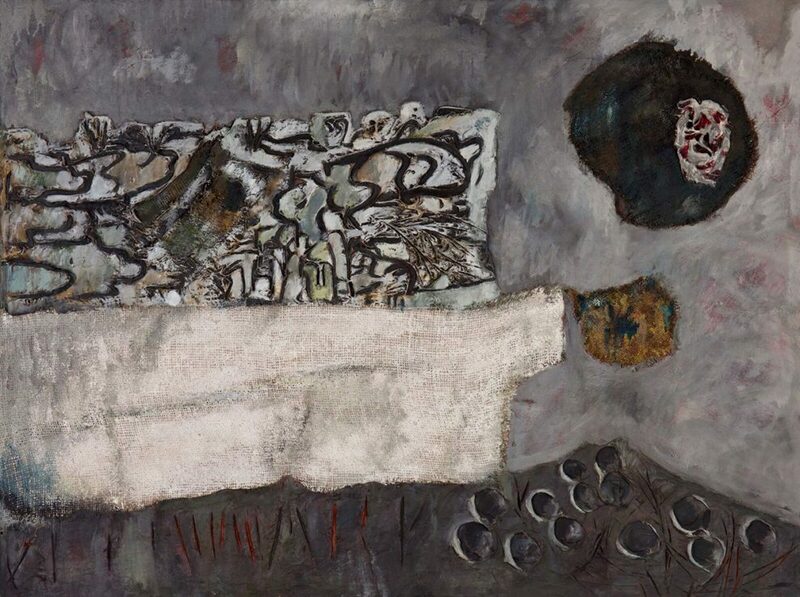 The Lewers were part of this generation of artists active in the mid 20th century who sought to develop a new visual language ‘that expressed the ideals and dilemmas of the new modern world rather than the world of appearances’(19) and in Sydney they found a supportive environment. Gerald’s work shows a steady progression towards pure abstraction and the expression of a singular, highly personal vision based on his affinity with the natural world, from the early sculptures that reflect the influence of Skeaping in their stylised figuration of animal forms, to the graceful refinement of mature works such as Sleeping bird (c. 1950), and the late steel sculptures and fountains that miraculously convey dynamic movement through static form. 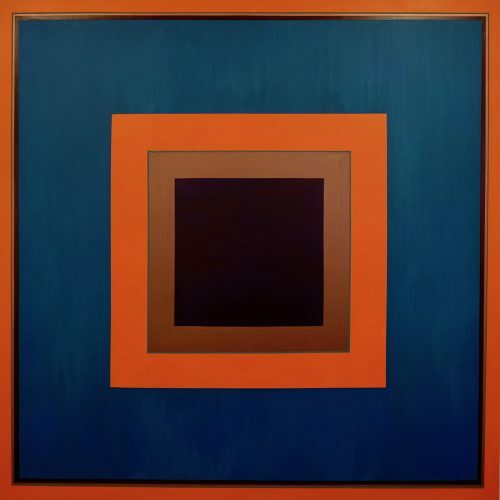 From the very beginning Margo’s work was characterised by a consistent focus on abstraction. She believed that ‘by reducing the whole to an abstract minimum, the painting should say more’(20) and during the course of her career working across various media, she responded to the contemporary zeitgeist in art, moving from geometric imagery in the 1950s, to gestural expressionism the following decade and vibrantly coloured hard-edged sculpture in the 1970s. Gerald Lewers working on reclining figure. Free from the commitments of full-time work, Gerald was instrumental in the establishment of the Society of Sculptors and Associates in 1951. It is not surprising then that Gerald’s work in these years is marked by a series of major public commissions in Sydney, Melbourne, Canberra and beyond. Placed in relation to prominent new structures including the Reserve Bank building in York Street, Sydney, and University House at the Australian National University, Canberra, these sculptures and fountains allowed Gerald to work on an unprecedented scale and brought contemporary abstraction into the public domain. Word of the Emu Plains garden must have spread because in 1957 the Lewers were commissioned to design a landscaped rock garden (combining sculpture, rocks and plants) for the MLC Building in North Sydney. Similarly, the copper fountain Gerald made for ICI House in Spring Street, Melbourne in 1958, was also commissioned as part of a garden, the overall design of which was a collaboration between the architects, Gerald and landscape consultant, Jon Stevens. (25) Designed by Bates Smart McCutcheon, ICI House was the tallest building in Melbourne at the time, a stark and ultramodern tower of steel and glass. 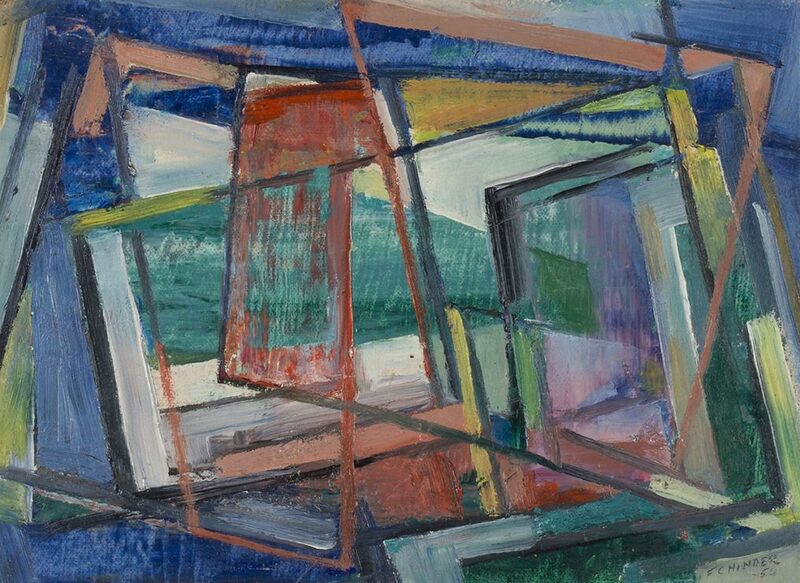 From 1958 Gerald began to work primarily in metals and moved more decisively towards total abstraction. The ICI commission revealed his natural skill with both his new medium and non-representational form. As a fountain, this work incorporated moving water, which contributed to the overall expression of movement, as well as introducing a dynamic sound component as it poured and splashed onto the stones beneath. Fellow sculptor Lyndon Dadswell wrote of this piece ‘that [Lewers’] solving the problem of wedding his fountain to the ICI Building … [was] so successful that, if ever a man made a memorial to himself, it was in this splendid integration of sculpture and architecture.’(26) While this was not what Gerald had in mind when he made the ICI sculpture, his life would end prematurely in a riding accident only four years later. From the beginning, Margo’s practice was characterised by a singular commitment to abstraction; however, it was not in her nature to stand still, and her work continued to evolve throughout her career as she responded to various influences, experimenting with new materials, techniques and modes of expression. Her willingness to change direction was shown in the early 1970s when she made perhaps the most dramatic shift of her career and produced a small group of sculptures using coloured plexiglass. There were numerous influences at work: her long-held interest in light and colour, and the ways in which they interact; the memory of seeing work in perspex by the constructivist Naum Gabo in London almost 40 years earlier; the example of other artists, including her friend Frank Hinder, working with plastics that were becoming increasingly accessible; the contemporary trend in art towards the hard-edge and bright colour; and her own recent paintings which overlaid large, geometric planes of flat colour to create the illusion of three-dimensional space. Margo’s decision to work in three dimensions may also have been influenced by her experience of completing two of Gerald’s large sculptural commissions after his death,(28) and they were arguably the most unique and distinctive works of her career. 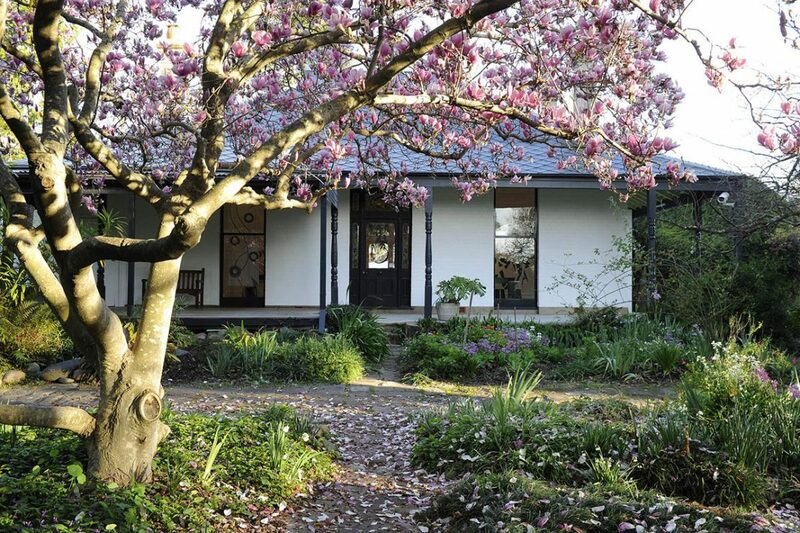 In describing the Lewers’ house at Emu Plains as a focus point of Australia’s still tentative civilisation, Patrick White recognised it as a site of progressive thought and activity. Gerald and Margo Lewers created that place, consciously fashioning an environment that allowed them and the circle of people that gathered around them to foster innovative ideas and to express themselves in new and inventive ways. Within the history of the visual arts in Australia, Gerald and Margo Lewers are key figures who played a pivotal role in the introduction of modernist ideas and ideals, and each made a significant contribution to the development of a modernist language in design, painting and sculpture. The Lewers are unusual in that they were a couple, united by marriage and a shared goal that was expressed through their individual practices and the way they lived. 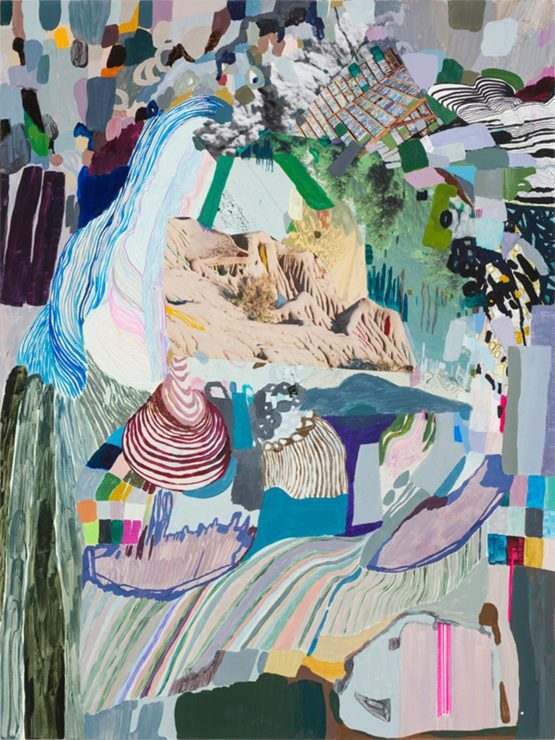 Unlike the work of many artists, which is typically seen in private spaces, the Lewers both eventually worked on a grand scale, undertaking major public commissions that brought contemporary abstraction into the public realm and, while they may not be household names, their work – from Melbourne to Canberra, Sydney and beyond – remains familiar. It is fitting that their spirit and vision is continued in the Penrith Regional Gallery & The Lewers Bequest at their home in Emu Plains, celebrating their work and encouraging that of subsequent generations. Author Kirsty Grant was published for the online catalogue for the exhibition Emu Island: Modernism is Place at Penrith Regional Gallery & The Lewers Bequest, celebrating 75 years of modernist art and living at Emu Plains. 1. Patrick White 1962, ‘Gerry Lewers has left us’, Sydney Morning Herald, 18 August, p. 12. 2. See Denise Hickey 1982, Gerald and Margo Lewers: their lives and work, Grasstree Press, Mosman, p. 40 and Michael Crayford, ‘Lewers, Gerald Francis (1905–1962)’ in Australian Dictionary of Biography,http://adb.anu.edu.au/biography/lewers-gerald-francis-10821, accessed 31 May 2017. 3. Letter dated 24 April 1934, quoted in Peter Pinson 2016, Gerald Lewers sculptor, Phillip Mathews Book Publishers, Willoughby, pp. 16–17. Pinson notes that the letter goes on to clarify that the ‘mug’ who bought work by Nicholson on that occasion was Arthur Wheen, who paid 10 guineas for a painting. 4. Margo Lewers 1934, ‘Modern art: an Australian in London, where we fail’, Sydney Morning Herald (Women’s Supplement), 28 June, p. 7. 7. See Pamela Bell 2013, ‘Margo Lewers and the establishment of Notanda Gallery’ in Deborah Edwards & Denise Mimmochi (eds), Sydney moderns: art for a new world, Art Gallery of New South Wales, Sydney, pp. 274–75. 8. Alister Brass 1969, ‘Talking with Margo Lewers’, Art and Australia, vol. 7, no. 3, December, p. 242. 10. See ME McGuire 2016, Cynthia Nolan, a biography, Melbourne Books, Melbourne, pp. 60–80. 11. Heather Johnson 1988, Roy de Maistre: the Australian years 1894–1930, Craftsman House, Sydney, p. 77. 12. See Cassi Plate 2013, ‘Carl Plate and the Notanda Gallery’ in Edwards & Mimmochi, op. cit., pp. 226–227. 13. James Gleeson, ‘Fine sculpture in exhibition’, The Sun, 5 March 1952, p. 34. 14. Allan R Henderson 1939, ‘Contemporary art advances’, Art in Australia, 3rd series, no. 76, August 1939, p. 14. 15. Hickey, op.cit., p. 37. 16.Nancy Borlase 1968, ‘Three decades of the contemporary art society’, Art and Australia, vol. 6, no. 1, June, p. 71. 17. Denise Whitehouse 1999, ‘The Contemporary Art Society of NSW and the theory and production of contemporary abstraction in Australia 1947–1961’, PhD thesis, Monash University, p. 27. 21. 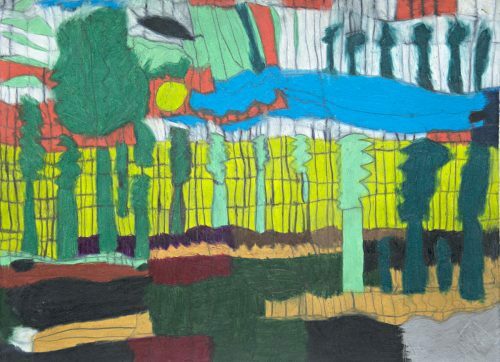 Margo said that prior to moving to Emu Plains where there were few interruptions, no telephone and her daughters were away at boarding school, she only produced two or three paintings a year, working whenever she could find time. Margo Lewers & Hazel de Berg 1962, op. cit. 22. Pinson, op. cit., p. 60. 24. ibid., p. 46 and Hickey, op.cit., pp. 63–64. 25. Philip Goad 2002, ‘New land, new language: shifting grounds in Australian attitudes to landscape, architecture, and modernism’ in Marc Treib (ed. ), The architecture of landscape 1940–1960, University of Pennsylvania Press, Philadelphia, p. 257. 26. Quoted in Ken Scarlett 1980, Australian sculptors, Nelson, West Melbourne, p. 379. 27. The other female artists were Eva Kubbos and Jacqueline Hick. See Ross K. Luck, 1976, The Australian Painters, 1964-1966: Contemporary Painting from the Mertz Collection, Griffin Press, Adelaide. 28. See Hickey, op. cit., pp. 97–103 and Pinson, op. cit., pp. 74–76. 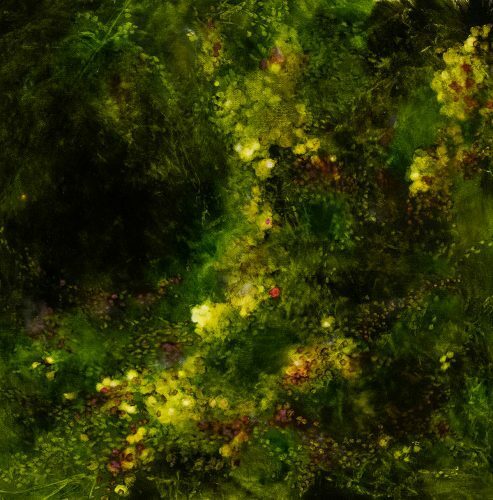 Kylie Elkington’s soft-hued botanical paintings recall the temperament and sincerity of Pre-Raphaelite works from the mid-19th century.